She's considered the world's first novelist, but we're not even sure of her name. "Murasaki" may or may not have been adopted from the name of a female character in her most famous work, The Tale of Genji. "Shikibu" indicates her father's office in the Japanese imperial government at one time. She was a member of the ruling Fujiwara family in late-tenth and early-eleventh century Japan. Her father, who was twice a provincial governor, had her educated more than was usual for a woman then, and about the year 998 she married a distant relative, a member of the Imperial guard. She had children but, after her husband died, she went to court in the service of Empress Akiko. 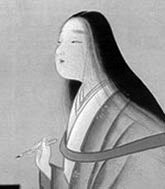 At court she wrote (or continued writing) the long story Genji monogatari—The Tale of Genji as we know it in English. The fifty-four instalments were created for reading aloud to others at the court, mainly women. While men tended to write in scholarly, classical poetry, usually in Chinese, women like Murasaki wrote in vernacular Japanese prose to entertain. In this we could say that her fiction stands as a forerunner of the development of the novel—works written in the language of the people—several centuries afterwards in Europe. The Tale of Genji tells of the complicated love-life of a dashing prince, Genji, and several of his male offspring. The original manuscript of Genji was lost but it was pieced together a century later from scrolls repeating the story. It is also possible Murasaki was not the sole author, as some scholars think the transitional or later chapters may have been added by others who continued the story. In addition to other writing, Murasaki kept an historically important diary over two years, in which she recounted court life and criticized its frivolous nature. She was also known as a poet in her day. Nothing is known of how Murasaki's life ended. It is speculated she died at court in her mid to late thirties, but it is also thought she may have left court to join a convent where she eventually died around age fifty.